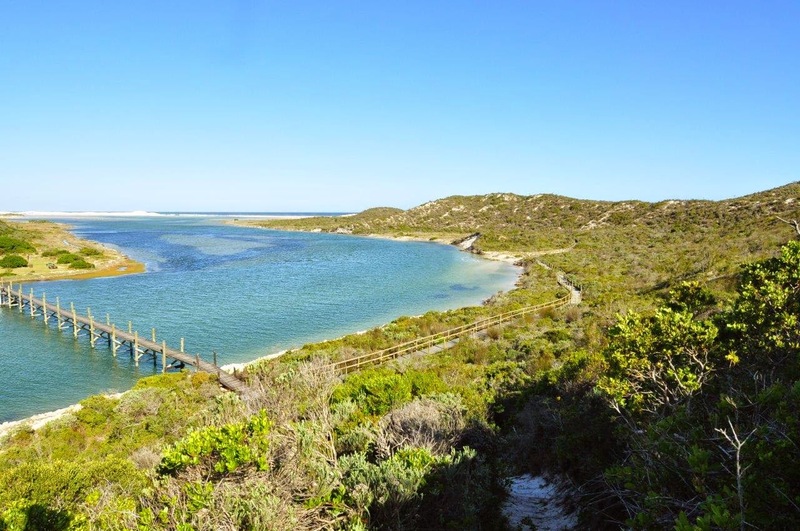 De Mond is a small nature reserve of 954 hectares on the Western Cape coast, 30 kilometers south of Bredasdorp, between Arniston and Struisbaai, and very close to the most southerly point of Africa. The Heuningnes estuary inside the reserve is the smallest Ramsar wetland in South Africa and received its status on 2 October 1986. The Heunignes estuary is an important nursery for the beautiful sea bird, the Damara Tern, which also appears as the reserve’s logo. Currently there are only 6 breeding pairs, but that makes it the second largest breeding colony after Walvisbay. The Caspian Tern, the endangered African Black Oyster Catcher, and even Blue Cranes also breed in the quiet, protected areas of the reserve. Large numbers of Flamingoes wade in the shallow water on the beach. White-breasted Cormorants scan the sea from the beach. We even came across a nest of a Spotted Eagle Owl with two chicks, right there next to the picnic trees! The Heunignes estuary remains the focus point of the reserve. Die Spotted Grunter is one of the important fish species that breeds here. Hippocampus is the scientific name of a small sea horse that finds an important habitat for survival here at the estuary. Only small mammals such as Grey Duiker and Steenbok can be seen here. Reptiles are common and one should be careful for snakes – especially Puff Adders during spring. Most visitors come to De Mond because of the special angling opportunities inside the reserve. Spotted Grunter and Cob can be caught from the beach or river mouth. Other visitors come here for a day picnic under the shady milkwoord trees and the short, 7 kilometers, hiking trail along the river, over the dunes, and along the beach. Apart from the ablution facilities, there are no shops or other facilities at De Mond. You have to bring your own food and drinks. Limited accommodation is available in the form of a single 6-sleeper self-catering house. There are no camping facilities inside the reserve.